My name is Katie and I was diagnosed with Parkinson’s disease when I was 20 years old. To be given such a devastating diagnosis during my college years, I found it easier to deny the whole picture of what my future was to look like and inevitably become. My symptoms were mildly present, but growing more and more physically uncomfortable. Even so, I continued to do my best to minimize any inquiries people may have had. At the time, it was extremely overwhelming and depressing for me to even think about having a diagnosis that I have always thought of affecting the elderly population. Additionally, I had no family history of Parkinson’s. This added to my 20ish year old confused mentality. Through the years, I continued to be in a state of denial. I sought out several opinions throughout my 20’s, some of which included Mayo Clinic and a holistic doctor who diagnosed me with mercury toxicity. The diagnosis of mercury toxicity was something I held on to for several years. This was a much easier diagnosis for me to share with people whenever they inquired. For me, it didn’t carry all of stigma like Parkinson’s disease. At age 27, I married my college sweetheart. A year later, I fulfilled my lifelong dream and became a first-time mom. It was a very physically challenging 9 months, but I was able to work up until the day I had my son, while being off of my medication. Three years later, I obtained my second lifetime goal and had my second son. This time, however, I was very grateful to have been a stay-at-home mom because walking became difficult for me and I suffered overall from severe physical limitations being off my medication yet again. The three year differences of my disease progression from being off my medications were very interesting for me to put into perspective. Within those three years, it became evident to me that my symptoms had significantly progressed. It has been 14 years since my initial diagnosis and because of Rock Steady Boxing, I have finally been able to accept my PD and feel safe in my own body. After all these years, I decided that it was time for me to fight back and Rock Steady Boxing has allowed me to do this. My younger son is now three years old and I feel the best I ever have. During the 9 months that I have been boxing with Rock Steady Boxing Peoria, I have gained the confidence I need to fight back against my symptoms. During my pregnancies, as well as time in which I had to transition medications, I had to use a walker. I now can jump rope up to a count of 42. I would occasionally fall to my bottom because I would freeze as I attempted to pull open the fridge. I can now walk backwards on a 2×4 board as part of an obstacle course. I am excited and look forward to going to my Rock Steady Boxing Peoria classes because I have learned that it helps me to feel better and fends off my symptoms. Rock Steady Boxing is my breath of fresh air – the place I go to and truly feel as everyone understands what these symptoms feel like. They understand my daily struggles. Rock Steady is where I see the people that provide me with the endless amount of support that I need when days are hard and times are tough. Rock Steady is where I see my friends – where I get inspired when I feel like I just want to give up – where age doesn’t matter because we are all fighting the same fight – we are in this together. We are a team. We are Rock Steady Boxing! 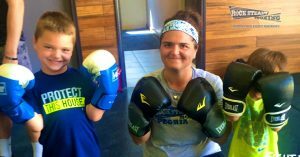 Katie boxes with RSB affiliate Rock Steady Boxing Peoria, in Peoria, Illinois.